I’ve tried out cooking traditional Filipino dishes in the slow cooker like the Bulalo and the Pork Sinigang and have been raving about the dishes that came out. The slow cooker gives the soup more taste and all the flavors of the ingredients just come together and pop on your taste buds. I couldn’t be happier! 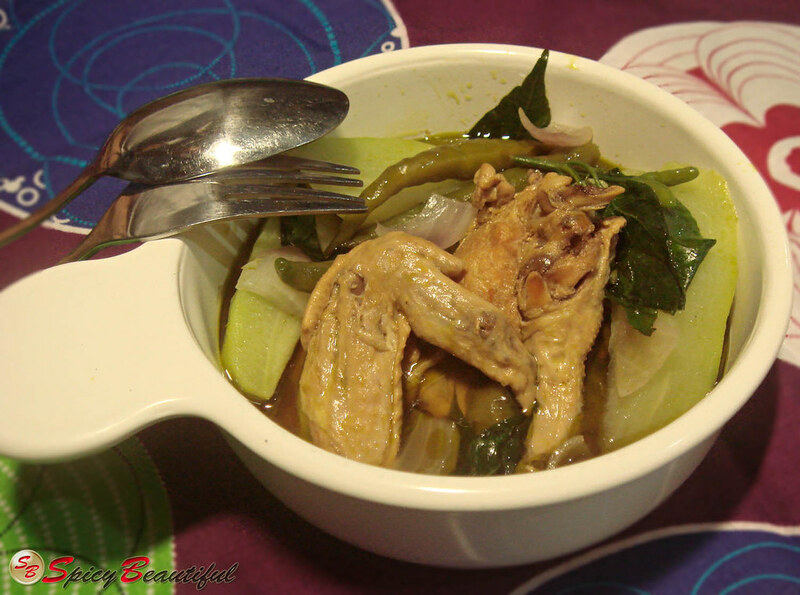 :) So we tried another Filipino favorite, the Tinolang Manok or Chicken Soup with Chayote and Chili Leaves. With the time the slow cooker takes to cook a dish, it’s always better to cook it on a slow and lazy Sunday. 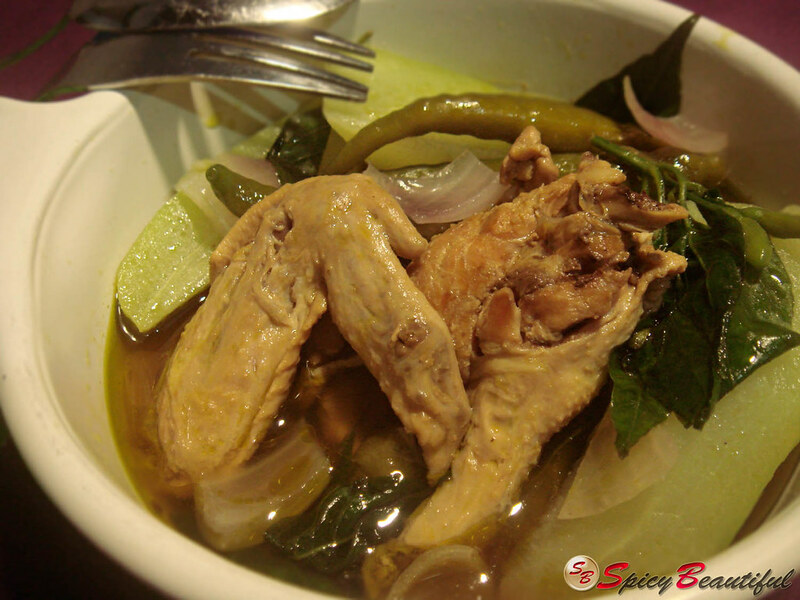 We cooked this Chicken Tinola several Sundays back when the seasonal monsoon rains were pouring on us like crazy. As always, a downpour gives us an excuse to whip up one of our good ol’ comfort soups. I don’t know about you but a nice hot bowl of soothingly warm soup cheers me up every time! This recipe has some variations to the traditional dish that my mom used to prepare and Van always cooks. For one, we were out of fresh green papaya so we used chayote instead. And… I had to have some heat added in. You know me, I can’t help myself. So I added some green bird’s eye chili to the soup while it was cooking. I swear the chili leaves are really part of the original recipe and not one of my crazy-spicy-overboard ideas! 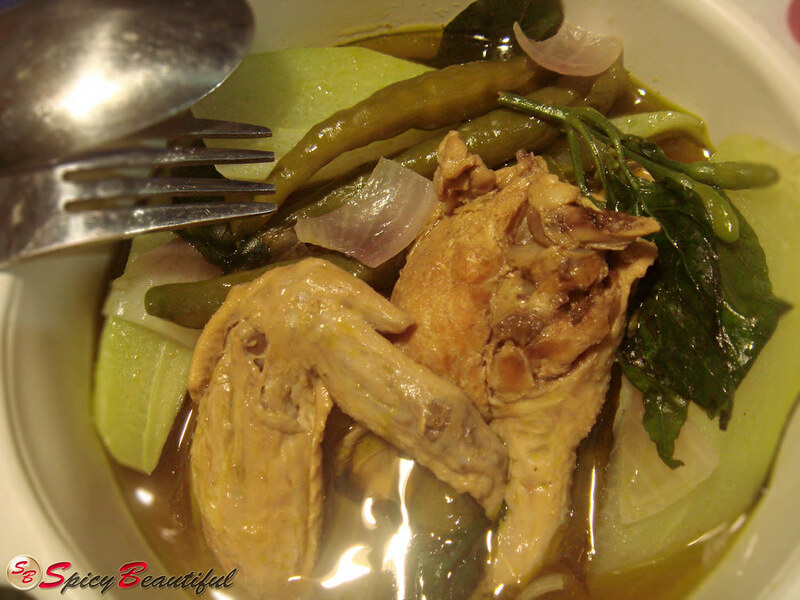 As expected, the slow cooker version of the Chicken Tinola was cooked to the bones. The meat absorbed all the flavors and the soup was as comforting as promised. Normally, the soup is clearer but this version has a green tinge because of the green chili and chili leaves. But the heat sure added that much needed warmth to get your body revved up. Try this recipe out one of these damp and rainy days and it’ll surely be included in your go-to comfort food list! 1. In a medium pot, heat oil. Sauté the onion until it is semitransparent then add in the ginger and jalapenos. Sauté for a minute or two until the ginger is fragrant. 2. Put in the chicken cuts and stir-fry for 4-5 minutes until chicken is slightly browned. Season with the fish sauce and soy sauce. Cook for another minute then remove from heat. 3. Pour in the contents of the pot inside the slow cooker stoneware pot. Add the chicken bouillon cube and water. Cook in high for 4 hours. 4. After 4 hours, add in the chayote quarters and cook for another 2 hours. 5. After 2 hours, add in the green bird’s eye chilis and chili leaves. Cook for just 15 minutes. Do not overcook the chili leaves since it will overpower the taste of the soup. Trust me, you don’t want that to happen. Season with ground black pepper and salt according to your preference. 6. Total cooking time is 6 hours and 15 minutes. Serve while still hot!